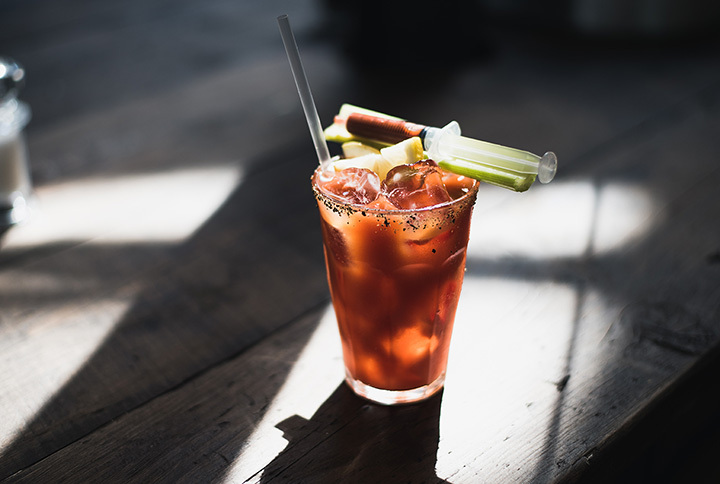 The 10 Best Places for a Bloody Mary in West Virginia! Everyone who enjoys adult beverages has their favorite, but one of the most popular cocktails is the Bloody Mary. Traditionally served in a tall glass with a sprig of celery for garnish, you can find this hair-of-the-dog drink at any of the 10 places listed below around West Virginia with various adaptations. Try one or try them all! You’ll certainly be coming back for more. Known as a friendly neighborhood bar, Par 500 Sports Grill offers a great atmosphere for grabbing your favorite drink with friends. Open from 3 p.m. to 3 a.m. every day, Par 500 Sport Grills is located in Parkersburg, West Virginia, and is a great place to get your game on. Great food and a comfortable and casual atmosphere make this bar one of the favorites in the area, and if you’re for great Bloody Mary breakfast, you’ll get eggs any way you like, bacon, biscuits and gravy, French toast, and the best Bloody Marys. Generations Restaurant & Pub in Wheeling, West Virginia, is a lively tavern where you can get a variety of comfort food and drink at reasonable prices. Voted one of the “101 Best Places to Dine in West Virginia,” Generations has literally been around for four generations. The bar is open every day until 2 a.m., and they have appetizers, burgers, other specialty sandwiches, wings, pierogis, pizza, salads, soups, wraps, pasta, and some of the best drinks around. Stop by for Happy Hour or to get the special of the day. Beverages include draft beer, ciders, ales, IPAs, lagers, and possibly the best Bloody Mary in the state. If you’re into fusion-inspired food, then Black Bear Burritos in Morgantown, West Virginia, is your new favorite eatery. This family-friendly place isn’t just for college students. Open every day except Sunday, daily specials might include High Torque Tacos made with slow-roasted ancho pork belly, chili powder, fresh blueberry compote, red onion, avocado, and ricotta salata nested on frisee lettuce. There’s free wireless Internet and they support local farmers to provide fresh ingredients for all their food. Wash your favorite burrito down with their signature Bloody Mary for a special treat. What more than great food and great drinks could you want from a local restaurant and lounge? How about live music every Thursday through Saturday night? That’s what you’ll find at The RailYard in Bluefield, West Virginia. Get a burger and a beer for under $10 on Tuesday, try Open Mic Night on Wednesday, sit back and relax to the sounds of Jazz Night on Thursday, or celebrate life Friday and Saturday nights with $5 martinis and other drink specials. With a good selection of beer on tap, you can also find your favorite cocktail, like the ever-popular Bloody Mary. The beautiful and historic Blennerhassett Hotel in Parkersburg, West Virginia, is the location for friendly customer service, eclectic comfort food, and popular drinks like the signature martinis, bourbons, scotches, or specialty drinks like a Sidecar or Bloody Mary. Start your weekend off to a great beginning at Spats! Restaurant inside the hotel by enjoying an amazing brunch that includes your favorite alcoholic beverage. Voted the “Award of Excellence” by Wine Spectator for 12 years in a row, you’re sure to find something special. Another one of the Mountain State’s historically restored inns, the General Lewis Inn located in Lewisburg, West Virginia, is a grand spot to spend the night, eat dinner in the original part of the hotel built in 1834, or enjoy a Pickled Okra Bloody Mary. Family-owned and operated, this is Southern elegance defined. Open for breakfast, lunch, dinner, dessert, and weekend brunch, they have an extensive selection of cocktails, beers, and other interesting beverages along with tapas, appetizers, snacks, pasta, salads, and entrees. Award-winning and palate pleasing, you’ll feel pampered after a visit here. You’ll have a chance to try a bacon-infused Vodka Bloody Mary when you stop by the Iron Horse Tavern in Morgantown, West Virginia. If you’ve never been to a gastropub before, you’re in for a special treat. You’ll get to try American cuisine like you’ve never had it before, and be able to wash it down with local beers and specialty cocktails in a friendly and inviting environment. There are weekly food and drink specials, and a Ladies Night is every Thursday. Open every day with brunch on Sunday from 10 a.m. until 3 p.m. Friendly bartenders who love to make sure you get what you want are what you’ll find at Boyd’s Steakhouse in Martinsburg, West Virginia. This steak place offers more than just good steak, and is open for a casual lunch or an elegant and relaxed dinner. One of the coolest things about Boyd’s is that they have a beautiful 20-foot mahogany bar from around 1880 that was allegedly purchased from an Al Capone estate. Whether or not that’s true, it gives the heavily wood décor an earthy and comfortable feel. You can get items like Gator Tail Caribbean Style, Baltimore & Ohio Crab Soup, and some of the best salads around. But the steaks are the star. Simple and delicious and served with a variety of choices for sides. Make sure to try one of their Bloody Marys as you enjoy the speakeasy-style surroundings. If you enjoy vegetarian food options when you eat out, try Bluegrass Kitchen. Located in Charleston, West Virginia, this 1920s-style is a relaxed and casual environment for enjoying healthy and unique food choices. You can choose from organic vegetables and free range meats for lunch, dinner, or brunch. There are daily specials and the blueberry buttermilk pie is to die for! Whatever you get, try a mimosa or Bloody Mary as a great accompaniment, especially with the cat fish or tacos. A great American menu with contemporary takes. That’s what you’ll find at Tidewater Grill in the Mountain State’s capital city of Charleston. Located in a busy shopping area, you can order anything from oysters on the half shell to club sandwich and fries and everything in between. Dine inside or outside, with your special someone or a group of friends, the Tidewater Grill has been pleasing palates for more than 30 years with great fresh seafood. Join others for Happy Hour Monday through Friday from 3 p.m. to 7 p.m. with drink specials, including $3 off on Bloody Marys.